Quinoa, the new super food has found its place in my kitchen. I love it because it is nutrient packed and so versatile! For a few years now I have been making salads, soups, pilafs, main dishes and baked goods using this tasty and healthy ingredient. For those of you who are gluten-intolerant or diabetic, this is the grain for you (although, technically speaking it’s not a grain, even thought it behaves like one in most dishes). Quinoa is high in protein and digests slowly, so it doesn’t spike your blood sugar levels like rice does. This is very important if you are watching your calories or have blood sugar issues. I have substituted it in many dishes that call for couscous or rice. The first time I made this recipe, my husband and I had it for dinner as an accompaniment to grilled turkey burgers. We were s so excited about this salad that we woke up the next morning and promptly piled up big bowls of the leftovers for breakfast! Last summer I made it for my brother-in-law who swore he didn’t like quinoa. Well, he is now a convert, much to his own surprise! 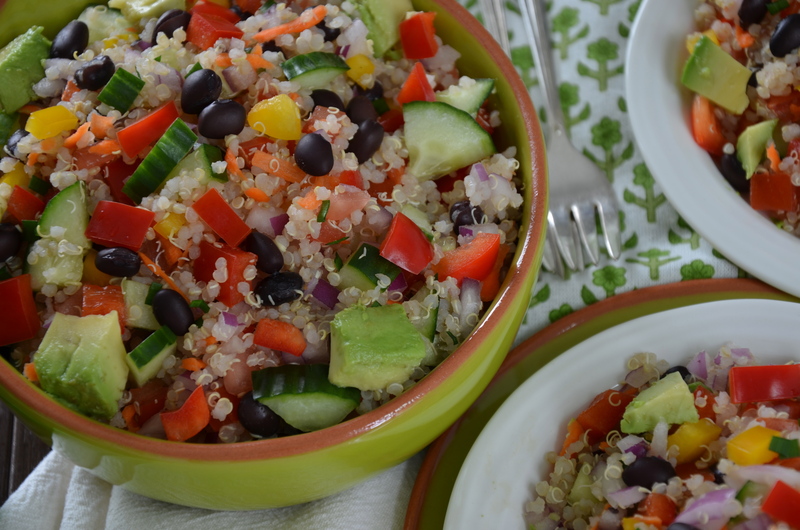 I know that there are many quinoa salad recipes floating around out there in cyberspace, but this one is still my favourite recipe, and the one that I keep going back to time and time again. It lasts several days in the fridge, so it can be made ahead of time for an event. Also, it is very portable, so makes a nice addition to pot-lucks or barbeques. It can be served as a side dish, or eaten as a main dish. I think you will like it. Rinse quinoa in cold, running water and place in a saucepan with the water and salt. Bring to a boil. Reduce heat to low and cook, covered for 10 minutes. Turn heat off. Keep saucepan on the element, covered and allow to cook for another 5 minutes. Remove from the heat and let stand for 5 more minutes. Fluff the quinoa with a fork. Remove to a large bowl and allow to cool. Toss the salad with a wooden spoon to mix. Thanks Geraldine! So glad you like it! Can’t wait to try this it is right up my street. Hey Darlana!! Me too!! I love cooking with you!! We’ll have to do it again really soon…I’m so glad you checked out the bog! Love you too!